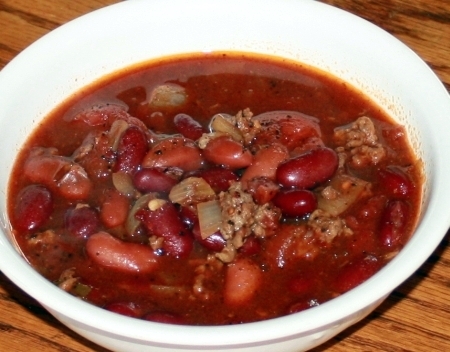 This is a pretty simple Classic American Chili recipe, but it's one of my favorites. It's originally from Jeff Smith's first cook book, The Frugal Gourmet [amazon.com]. "Con Carne" is Spanish for "with meat". By the way, don't substitute canned beans for the dry ones. The flavor and texture of cooked dried beans is just so much better than those mushy almost flavorless little legume lumps from a can. If you are interested, I also have recipes for Vegetarian Cashew Chili, and for White Chili. lima. I prefer the traditional kidney though. Cover the beans with plenty of water. Boil for three minutes, then soak overnight. Drain and rinse. Cook the beans in 8 cups of water (or more if necessary) until tender. Most beans take about 45 minutes to 1 hour. Do not overcook your beans! You may need to add water as they cook. Keep enough water on them to keep them covered. After cooking, reserve the liquid, draining the beans. Put the canned peeled tomatoes into a medium bowl and user your hands to break up the tomatoes, into bite sized pieces. Sauté onion and garlic in the oil in a Dutch oven. Add the ground beef browning slightly, and breaking up into pieces the size you'd like in your chili. Add beans and remaining ingredients, simmer 15 minutes. Add some bean liquid and salt if necessary (I always add all of the bean liquid, but you may like your chili to be thicker than I like it). Garnish with chopped green onions, jalapenos, or shredded cheese, or sour cream.